The seventeen columns on the recto comprise part of a surgical treatise, the first thus far discovered in the ancient Orient, whether in Egypt or Asia. It is therefore the oldest known surgical treatise. This surgical treatise consists exclusively of cases, not recipes. The treatise is systematically organized in an arrangement of cases, which begin with injuries of the head and proceed downward through the body, like a modern treatise on anatomy. The treatment of these injuries is rational and chiefly surgical; there is resort to magic in only one case out of the forty-eight cases preserved. Each case is classified by one of three different verdicts: (1) favorable, (2) uncertain, or (3) unfavorable. The third verdict, expressed in the words, 'an ailment not to be treated,' is found in no other Egyptian medical treatise. This unfavorable verdict occurring fourteen times in the Edwin Smith Papyrus marks a group of cases (besides one more case) which the surgeon cannot cure and which he is led to discuss by his scientific interest in the phenomena disclosed by his examination." 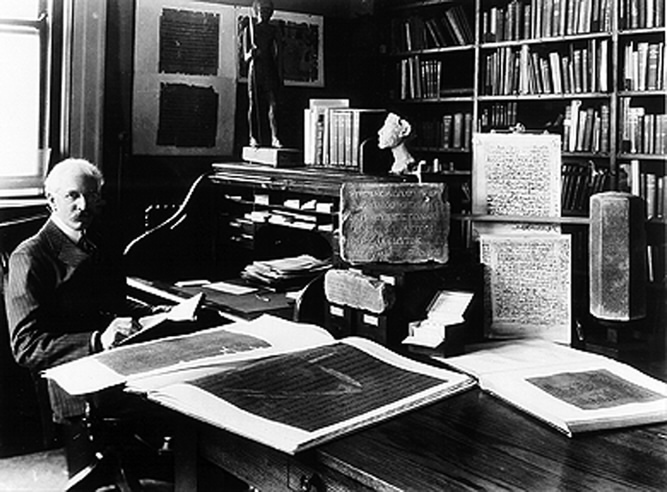 According to Breasted, the Edwin Smith Papyrus is a copy of an ancient composite manuscript which contained, in addition to the original author's text (3000-2500 B.C. ), a commentary added a few hundred years later in the form of 69 explanatory notes (glosses). It contains 48 systematically arranged case histories, beginning with injuries of the head and proceeding downward to the thorax and spine, where the document unfortunately breaks off. These cases are typical rather than individual, and each presentation of a case is divided into title, examination, diagnosis, and treatment. There is a definite differentiation between rational surgical treatments and the much less employed medico-magical measures. Significantly, trepanation is not mentioned. "The latter, according to our present day terminology would be classified as follows: two compound linear fractures; four compound depressed fractures; four compound comminuted fractures; and one comminuted fracture without external wound. The symptoms and signs of head injury are given in considerable detail. Feeble pulse and fever are associated with hopeless injuries and deafness as well as aphasia are recognized in fractures of the temporal region." Case One: Instructions concerning a wound in his head penetrating to the bone of his skull. Examination: If thou examinest a man1 having a wound in his head, while his wound does not have two lips, penetrating to the bone of his skull , (but) not having a gash, thou shouldst palpate his wound (or, thou shouldst lay thy hand upon it); shouldst thou find his skull uninjured, not having a perforation; a split, or a smash in it. Treatment: Thou shouldst bind it with fresh meat the first day (and) treat afterwards with grease, honey (and) lint every day until he recovers. Gloss: "Thou examinest a man," : counting any one like counting things with a bushel . (For) examining (h�t , literally "measuring") is like one�s counting a certain quantity with a bushel, (or) counting something with the fingers , in order to know . It is measuring (h�t ) things with a bushel which -- one in whom an ailment is counted , like measuring (h�t ) the ailment of a man, in order to know the action of the heart . There are canals (or vessels , mt ) in it (the heart) to every member , Now if the priests of Sekhmet or any physician put his hands (or) his fingers upon the head , upon the back of the head upon the two hands , upon the pulse , upon the two feet , he measures (h�t ) the heart, because its vessels are in the back of the head and in the pulse ; and because its pulsation is in every vessel of every member. He says "measure" (h�.t ) regarding his wound because of the vessels (mt.w ) to his head and to the back of his head and to his two feet -- his heart in order to recognize the indications which have arisen therein ; meaning to measure it in order to know that is befalling therein. "while his wound does not have two lips,": his wound is narrow , not wide ; without gaping of one (lip) from the other. "penetrating to the bone of his skull , (but) not having a gash": there is a gaping of the flesh , although --------- over the bone of his skull , without gaping of one (lip) from the other, being narrow, not wide. Case Two: Instructions concerning a [gaping] wound [in his head], penetrating to the bone. Diagnosis: Thou shouldst say regarding [him]: "One hav[ing a gaping wou]nd in his head. An ailment which I will treat." Treatment: [Thou] shouldst bind [fresh meat upon it the first day; thou shouldst apply for him two strips of linen, and treat afterward with grease, honey, (and) lin]t every day until he recovers. Gloss: As for: "Two strips of linen," [it means] two bands [of linen which one applies upon the two lips of the gaping wound in order to cause that one join] to the other. Case Three: [Instructions concerning] a gaping [wo]und in his head, penetrating to the bone (and) perforating his [skull]. Diagnosis: Thou shouldst say [regarding] him: "One having [a gaping wound in his head, penetrating to the bone, (and) per]forating his skull, while he suffers with stiffness in his neck. An ailment which I will treat." Gloss: As for: "Moor (him) at his mooring stakes," it means putting him on his customary diet, without administering to him a prescription. Case Four: Instructions concerning a gaping wound in his head, penetrating to the bone, (and) splitting his skull. Diagnosis: Thou shouldst say regarding him: "One having a gaping wound in his head, penetrating to the bone, (and) splitting his skull; while he discharges blood from both his nostrils (and) from both his ears, (and) he suffers with stiffness in his neck. An ailment with which I will contend." Gloss: As for "(Until) thou knowest he has reached a decisive point," it means (until thou knowest whether he will die or he will live; for he is (a case of) "an ailment with which I will contend." Case Five: Instructions concerning a gaping wound in his head, smashing his skull. Diagnosis: Thou shouldst say regarding him: "One having a gaping wound in his head, penetrating to the bone, (and) smashing his skull, while he suffers with stiffness in his neck. An ailment not to be treated." Case Six: Instructions concerning a gaping wound in his head, penetrating to the bone, smashing his skull, (and) rending open the brain of his skull. Diagnosis: [Thou shouldst say concerning him]: "An ailment not to be treated." Treatment: Thou shouldst anoint that wound with grease. Thou shalt not bind it; thou shalt not apply two strips upon it: until thou knowest that he has reached a decisive point. Case Seven: Instructions concerning a gaping wound in his head penetrating to the bone (and) perforating the sutures of his skull . Examination: If thou examinest a man having a gaping wound in his head, penetrating to the bone, (and) perforating the sutures of his skull, thou shouldst palpate his wound, (although) he shudders exceedingly. Thou shouldst cause him to lift ; if it is painful for him to open his mouth, (and) his heart beats feebly ; if thou observe his spittle hanging at his two lips and not falling off, while he discharges blood from both his nostrils (and) from both his ears; he suffers with stiffness in his neck, (and) is unable to look at his two shoulders and his breast. First diagnosis: Thou shouldst say regarding him : "One having a gaping wound in his head, penetrating to the bone, (and) perforating the sutures of his skull; the cord of his mandible is contracted; he discharges blood from both his nostrils (and) from both his ears, while he suffers with stiffness in his neck. An ailment with which I will contend." First treatment: Now as soon as thou findest that the cord of that man�s mandible, his jaw, is contracted thou shouldst have made for him something hot until he is comfortable, so that his mouth opens. Thou shouldst bind it with grease, honey, (and) lint, until thou knowest that he has reached a decisive point. Second examination: If then, thou findest that the flesh of that man has developed fever from wound which is in the sutures of his skull, while that man has developed ty� from that wound, thou shouldst lay hand upon him . Shouldst find his countenance is clammy with sweat , the ligaments his neck are tense, his face ruddy , his teeth and his back, the odor of the chest of his head is like the bkn (urine) of sheep, his mouth is bound, (and) both his eyebrows are drawn , while his face is as if he wept. Second diagnosis: Thou shouldst say regarding him: "One having a gaping wound in his head penetrating to the bone , perforating the sutures of his skull ; he has developed ty�, his mouth is bound, (and) he suffers with stiffness in his beck. An ailment not to be treated." Third examination: If, however, thou findest that that man has become pale and has already shown exhaustion. Third treatment: Thou shouldst have made for him a wooden brace with linen and put into his mouth. Thou shouldst have made for him a draught of w�h-fruit. His treatment is sitting, placed between two supports of brick, until thou knowest he has reached a decisive point. Gloss: "Perforating the sutures of his skull," means what is between shell and shell of his skull; and that the sutures are (composed) of hide. "The cord of his mandible is contracted," means a stiffening on the part of the ligament at the end of his ramus, which are fastened to his temporal bone , that is at the end of his jaw, without moving to and fro, so that it is not easy for him to open his mouth because of his pain. "The cord of his mandible," means the ligaments which bind the end his jaw . as one says, "the cord" of a thing in (or as) a splint. "The ligaments of his neck are tense" means that the ligaments of his neck are stretched stiff by reason of his injury. "His face is ruddy" (tms�), means that the color of his face is red, like the color of tms� fruit. "The odor of the chest of his head is like the bkn of sheep," means that the odor of his crown is like the urine of sheep. "The chest of his head," it means the middle of his crown next to his brain. The likening of it is to a chest. "His mouth is bound, (and) both his eyebrows are drawn, while his face is as if he wept." means that he does not open his mouth that he may speak, both his eyebrows are distorted, one drawing upward the other drooping downward, like one who winks while. his face weeps. "He has become pale has already shown exhaustion, means becoming pale, because he is (a case of) "Undertake him do not desert him," in view of the exhaustion. Gloss: As for: "He walks shuffling with his sole," he (the surgeon) is speaking about his walking with his sole dragging, so that it is not easy for him to walk, when it (the sole) is feeble and turned over, while the tips of his toes are contracted to the ball of his sole, and they (the toes) walk fumbling the ground. He (the surgeon) says: "He shuffles," concerning it. Case Nine: Instructions concerning a wound in his forehead, smashing the shell of his skull. Examination: If thou examinest a man having a wound in his forehead, smashing the shell of his head. Treatment: Thou shouldst prepare for him the egg of an ostrich , triturated with grease (and) placed in the mouth of his wound. Now afterwards thou shouldst prepare for him the egg of an ostrich , triturated and made into poultices for drying up that wound. Thou shouldst apply to it a covering for physician�s use; thou shouldst uncover it the third day, (and) find it knitting together the shell, the color being like the egg of an ostrich. Repelled is the enemy that is in the wound! The adversary of Horus, on every side of the mouth of Isis. My rescue is the son of Osiris. Now afterwards thou shouldst cool it for him with a compress of figs, grease, and honey, cooked and cooled, and applied to it. Case Ten: Instructions concerning a wound above his eyebrow. Examination: If thou examinest a man having a wound above his eyebrow, penetrating to the bone, shouldst palpate his wound, (and) draw together for him the gash with stitching.. Diagnosis: Thou shouldst say concerning him: "One having a wound above his eyebrow. An aliment which I will treat." Treatment: Now after thou hast stitched it, thou shouldst bind fresh meat upon it the first day . If thou findest that the stitching of this wound is loose, thou shouldst draw (it) together for him with two strips (of plaster), and thou shouldst treat it with grease and honey every day until he recovers. Gloss: "Two strips of linen," it means two bands of linen, which one applies to two lips of the gaping wound, in order to cause one (lip) be joined to the other. Case Eleven: Instructions concerning a break of the column of his nose. Examination: If thou examinest a man having a break of the column of his nose, his nose being disfigured, and a depression being in it, while the swelling that is on it protrudes, (and) he has discharged blood from both his nostrils. Diagnosis: Thou shouldst say concerning him: "One having a break of the column of his nose, an ailment which I will treat." Treatment: Thou shouldst cleanse (it) for him with two plugs of linen. Thou shouldst place two (other) plugs of linen saturated with grease inside his two nostrils. Thou shouldst put him at his mooring stakes until the swelling is reduced (lit. drawn out). Thou shouldst apply stiff rolls of linen by which his nose is held fast. Thou shouldst treat him afterward with grease, honey, (and) lint, every day until he recovers. Gloss: "The column of his nose. ": the outer edge of his nose as far as its side(s) on the top of his nose, being the inside of his nose between his two nostrils. "His two nostrils,": the two sides of his nose extending to his two cheeks, as far as the back of his nose; the top of his nose is loosened. Case Twelve: Instructions concerning a break in the chamber of his nose. Examination: If thou examinest a man having a break in the chamber of his nose, (and) thou findest his nose bent, while his face is disfigured, (and) the swelling which is over it is protruding. Diagnosis: Thou shouldst say concerning him: "One having a break in the chamber of his nose. An ailment which I will treat." Treatment: Thou shouldst force it to fall in, so that it lies in its place, (and) clean out the interior of both his nostrils with two swabs of linen until every worm of blood which coagulates inside his two nostrils comes forth. Now afterwards thou shouldst take two plugs of linen saturated with grease and put them into his two nostrils. Thou shouldst place two stiff rolls of linen, bound on. Thou shouldst treat him afterwards with grease, honey, (and) lint every day until he recovers. Gloss: "A break in the chamber of his nose,": the middle of his nose as far as the back, extending to the region between his two eyebrows. "His nose bent, while his face is disfigured,": his nose is crooked and greatly swollen throughout; his two cheeks likewise, so that his face is disfigured by it. not being in its customary form, because all the depressions are filled with swelling, so that his face looks disfigured by it. "Every worm of blood which coagulates in the inside of his two nostrils,": the clotting of blood in the inside of his two nostrils, likened to the n�r,t worm, which subsists in water. Case Thirteen: Instructions concerning a smash in the nostril. Examination: If thou examinest a man having a smash in his nostril, thou shouldst place thy hand upon his nose at the point of this smash. Should it crepitate under thy fingers, while at the same time he discharges blood from his nostril (and) from his ear on the side of him having that smash; it is painful when he opens his mouth because of it; (and) he is speechless. Diagnosis: Thou shouldst say concerning him: "One having a a smash in the nostril. An ailment not to be treated." Case Fourteen: Instructions concerning a wound in his nostril. Examination: If thou examinest a man having a wound in his nostril piercing through, shouldst thou find the two lips of that wound separated from each other, thou shouldst draw together that wound with stitching. Diagnosis: Thou shouldst say concerning him: "One having a wound in his nostril, piercing through. An ailment which I will treat." Treatment: Thou shouldst make for him two swabs of linen, (and) thou shouldst clean out every worm of blood which has coagulated on the inside of his nostril. Thou shouldst bind (it) with fresh meat, the first day. when its stitching loosens, thou shouldst take off of him the fresh meat. (and) thou shouldst bind it with grease, honey (and) lint every day until he recovers. Gloss: "A wound in his nostril, through," means, that the two lips of his wound are soft, opening on the inside of his nose, as one says: "pierced through" concerning soft things. Case Fifteen: Instructions concerning a perforation in his cheek. Examination: If thou examinest a man having a perforation in his cheek, shouldst thou find there is a swelling, protruding and black, (and) diseased tissue upon his cheek. Diagnosis: Thou shouldst say concerning him: "One having a perforation in his cheek, an ailment which I will treat." Treatment: Thou shouldst bind it with ymrw and treat it afterward with grease (and) honey every day until he recovers. Case Sixteen: Instructions concerning a split in his cheek. Examination: If thou examinest a man having a split in his cheek, shouldst thou find that there is a swelling, protruding and red, on the outside of that split. Diagnosis: Thou shouldst say concerning him: "One having a split in his cheek, an ailment which I will treat." Treatment: Thou shouldst bind it with fresh meat the first day. His treatment is sitting until its swelling is reduced (lit. drawn out). Thou shalt treat it afterward with grease, honey, (and) lint every day until he recovers. Case Seventeen: Instructions concerning a smash in his cheek. Examination: If thou examinest a man having a smash in his cheek, thou shouldst place thy hand on his cheek at the point of that smash. Should it crepitate under thy fingers, while he discharges blood from his nostril, (and) from his ear on the side of him having that injury; (and) at the same time he discharges blood from his mouth, while it is painful when he opens his mouth because of it. Diagnosis: Thou shouldst say concerning him: "One having a smash in his cheek, while he discharges blood from his nostril, from his ear, (and) from his mouth, (and) he is speechless. An ailment not to be treated." Treatment: Thou shouldst bind with fresh meat the first day. His relief is sitting until its swelling is reduced (lit. drawn out). Thou shalt treat it afterwards with grease, honey, (and) lint every day until he recovers. Case Eighteen: Instructions concerning a wound in his temple. Examination: If thou examinest a man having a wound in his temple, it not having a gash while that wound penetrates to the bone, thou shouldst palpate his woun . Shouldst thou find his temporal bone uninjured, there being no split, (or) perforation, (or) smash in it. Diagnosis: Thou shouldst say concerning hi : "One having a wound in his temple. An ailment which I will treat." Treatment: Thou shouldst bind it with fresh meat the first day, (and) thou shouldst treat afterward with grease, (and) honey every day until he recovers. Gloss: "A wound , not having a gash, while it penetrates to the bone,": the wound is contracted, reaching as far as the bone, (though) there is no gash in it. He speaks of (its) narrowness, his wound not having two lips. "His gm� (temple),": the region thereof between the corner of his eye and the orifice of his ear, at the end of his eye and the orifice of his ear, at the end of his mandible. Case Nineteen: Instructions concerning a perforation in his temple. Examination: If thou examinest a man having a perforation (thm) in his temple, a wound being upon it, thou shouldst inspect his wound, saying to him: "Look at thy two shoulders." Should his doing so be painful (even though) his neck turns around (only) a little for him, while his eye in the side of him having that injury is blood-shot. Diagnosis: Thou shouldst say concerning him: "One having a perforation in his temple --- while he suffers with stiffness in his neck, An ailment which I will treat." Treatment: Thou shouldst put him at his mooring stakes until the period of his injury passes by, (and) thou shouldst treat with grease, honey, (and) lint every day until he recovers. Gloss: "His two eyes are blood-shot," means that the color of his two eyes is red like the color of s�s-flowers. The "Treatise on what pertains to the Embalmer" says concerning it: "His two eyes are red with disease like an eye at the end of its weakness." Case Twenty: Instructions concerning a wound in his temple, penetrating to the bone, (and) perforating his temporal bone. Diagnosis: Thou shouldst say concerning him: "One having a wound in his temple, penetrating to the bone, (and) perforating his temporal bone; while he discharges blood from both his nostrils, he suffers with stiffness in his neck, (and) he is speechless. An ailment not to be treated." Treatment: Now when thou findest that man speechless, his [relief] shall be sitting; soften his head with grease, (and) pour [milk] into both his ears. Case Twenty-One: Instructions concerning a split in his temple. Examination: If thou examinest a man having a split in his temple, shouldst thou find a swelling protruding on the outside of that split, while he discharges blood from his nostril and from his one ear having that split, (and) it is painful when he hears speech, because of it. Diagnosis: Thou shouldst say concerning him: "One having a split in his temple, while he discharges blood from his nostril and his ear having that injury. An ailment with which I will contend." Case Twenty-Two: Instructions concerning a smash in his temple. Gloss: As for: "Thou seest its fragments in the interior of his ear," it means that some of the fragments of the bone come away to adhere to the swab which was introduced to cleanse the interior of his ear. Case Twenty-Three: Instructions concerning a wound in his ear. Examination: If thou examinest a man having a wound in his ear, cutting through its flesh, the injury being in the lower part of his ear, (and) confined to the flesh, thou shouldst draw (it) together for him with stitching behind the hollow of his ear. Diagnosis: Thou shouldst say concerning him: "One having a wound in his ear, cutting through its flesh. An ailment which I will treat." Treatment: If thou findest, the stitching of that wound loosen (and) stick in the two lips of his wound, thou shouldst make for him stiff rolls of linen (and) pad the back of his ear therewith . Thou shouldst treat it afterwards with grease, honey, (and) lint every day until he recovers. Case Twenty-Four: Instructions concerning a fracture in his mandible. Examination: If thou examinest a man having a fracture in his mandible, thou shouldst place thy hand upon it, Shouldst thou find that fracture crepitating under thy fingers. Diagnosis: Thou shouldst say concerning him: "One having a fracture in his mandible, over which a wound has been inflicted, ! -------! (and) he has fever from it. An ailment not to be treated." Case Twenty-Five: Instructions concerning a dislocation in his mandible. Examination: If thou examinest a man having a dislocation in his mandible, shouldst thou find this mouth open (and) his mouth cannot close for him, thou shouldst put thy thumb(s) upon the ends of the two rami of the mandible in the inside of his mouth, (and) thy two claws (meaning two groups of fingers) under his chin, (and) thou shouldst cause them to fall back so that they rest in their places. Diagnosis: Thou shouldst say concerning him: "One having a dislocation in his mandible, An ailment which I will treat." Treatment: Thou shouldst bind it with ymrw, (and) honey every day until he recovers. Case Twenty-Six: Instructions concerning a wound in his lip. Examination: If thou examinest a man having a wound in his lip, piercing through to the inside of his mouth, thou shouldst examine his wound as far as the column, of his nose. Thou shouldst draw together that wound with stitching. Diagnosis: Thou shouldst say concerning him: "One having a wound in his lip, piercing through to the inside of his mouth. An ailment which I will treat . Treatment: Now after thou hast stitched it thou shouldst bind it with fresh meat the first day. Thou shouldst treat it afterwards with grease (and) honey every day until he recovers. Gloss: "A wound in his lip, piercing through to the inside of his mouth," means that the two lips of wound are soft, opening to the inside of his mouth. One says: "Pierced through" (ysdb) concerning soft things. Case Twenty-Seven: Instructions concerning a gaping wound in his chin. Examination: If thou examinest a man having a gaping wound in his chin, penetrating to the bone, thou shouldst palpate his wound. If thou shouldst find his bone uninjured, not having a split, (or) perforation in it. Diagnosis: Thou shouldst say concerning him: "One having a gaping wound in his chin, penetrating to the bone. An ailment which I will treat." Treatment: Thou shouldst apply for him two strips on that gash. Thou shouldst bind it with fresh meat the first day, (and) thou shouldst treat it afterwards with grease, honey (and) lint every day until he recovers. Case Twenty-Eight: Instructions concerning a wound in his throat. Examination: If thou examinest a man having a gaping wound in his piercing through to his gullet; if he drinks water he chokes (and) it come out of the mouth of his wound; it is greatly inflamed, so that he develops fever from it; thou shouldst draw together that wound with stitching. Diagnosis: Thou shouldst say concerning him: "One having a wound in his throat, piercing through to his gullet. An ailment with which I will contend." Second examination: If, however, thou findst him continuing to have fever from that wound. Second treatment: Thou shouldst apply dry lint in the mouth of his wound, (and) moor (him) at his mooring stakes until he recovers. Case Twenty-Nine:Instructions concerning a gaping wound in a vertebra of his neck. Diagnosis: Thou shouldst say concerning him: " [One having] a wound in his neck, penetrating to the bone, perforating a vertebra of his neck, (and) he suffers with stiffness in his neck. An ailment with which I will contend." Treatment: Thou shouldst bind it with fresh meat the first day. Now afterward moor (him) at his mooring stakes until the period of his injury passes by. Case Thirty: Instructions concerning a sprain in a vertebra of his neck. Examination: If thou examinest a man having a sprain in a vertebra of his neck, thou shouldst say to him: "look at thy two shoulders and thy breast." When he does so, the seeing possible to him is painful. Diagnosis: Thou shouldst say concerning him: "One having a sprain in a vertebra of his neck. An ailment which I will treat." Treatment: Thou shouldst bind it with fresh meat the first day. Now afterward thou shouldst treat [with] ywrw (and) honey every day until he recovers. Gloss: As for: "A sprain" he is speaking of a rending of two members (although) it (=each) is (still) in its place. Case Thirty-One: Instructions concerning a dislocation in a vertebra of [his] neck. Examination: If thou examinest a man having a dislocation in a vertebra of his neck, shouldst thou find him unconscious of his two arms (and) his two legs on account of it, while his phallus is erected on account of it, (and) urine drops from his member without his knowing it; his flesh has received wind; his two eyes are bloodshot; it is a dislocation of a vertebra of his neck extending to his backbone which causes him to be unconscious of his two arms (and) his two legs. If, however, the middle vertebra of his neck is dislocated, it is an emissio seminis which befalls his phallus. Diagnosis: Thou shouldst say concerning him: "One having a dislocation in a vertebra of his neck, while he is unconscious of his two legs and his two arms, and his urine dribbles. An ailment not to be treated." Gloss: As for: "A dislocation in a vertebra of his neck," he is speaking of a separation of one vertebra of his neck from another, the flesh which is over it being uninjured; as one says, "It is wnh," concerning things which had been joined together, when one has been severed from another. Case Thirty-Two: Instructions concerning a displacement in a vertebra of his neck. Examination: If thou examinest a man having a displacement in a vertebra of his neck, whose face is fixed, whose neck cannot turn for him, (and) thou shouldst say to him: "Look at thy breast (and) thy two shoulders," (and) he is unable to turn his face that he may look at his breast (and) his two shoulders. Treatment: Thou shouldst bind it with fresh meat the first day. Thou shouldst loose his bandages and apply grease to his head as far as his neck, (and) thou shouldst bind it with ymrw . Thou shouldst treat it afterwards with honey every day, (and) his relief is sitting until he recovers. Gloss: "A displacement in a vertebra of his neck," he is speaking concerning a sinking of a vertebra of his neck to the interior of his neck, as foot settles into cultivated ground. It is a penetration downward. Case Thirty-Three: Instructions concerning a crushed vertebra in his neck. Gloss: As for: "His falling head downward has caused that one vertebra crush into the next," it means that he has fallen head downward upon his head, driving one vertebra of his neck into the next. Case Thirty-Four: Instructions concerning a dislocation in his two collar-bones. First examination: If thou examinest a man having a dislocation in his two collar-bones, shouldst thou find his two shoulders turned over (and) the head(s) of his two collar-bones turned toward his face. First diagnosis: Thou shouldst cause (them) to fall back, so that they rest in their places . Thou shouldst bind it with stiff rolls of linen; thou shouldst treat it afterward with grease (and) honey every day, until he recovers. Second examination: If, however, thou shouldst find his two collarbones having a rupture (or the tissue) over it, penetrating to the interior. Second diagnosis: Thou shouldst say concerning him: "An ailment which I will treat." (Scribal error ) Gloss: "A dislocation in his two collar-bones" means a displacement of the heads of his sickle-bone(s). Their heads are attached to the upper bone of his breast to his throat, over which is the flesh of his gorge, that is the flesh that is over his bosom. Two canals are under it: one on the right and (one) on the left of his throat (and) of his bosom; they lead to his lungs. Case Thirty-Five: Instructions concerning a break in his collar-bone. Examination: If thou examinest a man having a break in his collar-bone (and) thou shouldst find his collar-bone short and separated from its fellow. Diagnosis: Thou shouldst say concerning him: "One having a break in his collar-bone. An ailment which I will treat." Treatment: Thou shouldst place him prostrate on back, with something folded between his two shoulder-blades; thou shouldst spread out with his two shoulders in order to stretch apart his collar-bone until that break falls into its place. Thou shouldst make for him two splints of linen, (and) thou shouldst apply one of them both on the inside of his upper arm. Thou shouldst bind it with ymrw, (and) treat it afterward with honey every day, until he recovers. Case Thirty-Six: Instructions concerning a break in his upper arm. Examination: If thou examinest a man having a break in his upper arm, (and) thou findest his upper arm hanging down, separated from its fellow. Diagnosis: Thou shouldst say concerning him: "One having a break in his upper arm . An ailment which I will treat." Treatment: Thou shouldst place him prostrate on his back, with something folded between his two shoulder-blades; thou shouldst spread out his shoulders, in order to stretch apart his upper arm until that break falls into its place. Thou shouldst make for him two splints of linen, (and) thou shouldst apply one of them to the inside of his arm, (and) the other of them to the underside of his arm. Thou shouldst bind it with ymrw, (and) treat afterward with honey every day until he recovers. Case Thirty-Seven: Instructions concerning a break in his upper arm, with a wound on it. Examination: If thou examinest a man having a break in his upper arm, on which a wound has been inflicted, (and) thou findest that break crepitates under thy fingers. First diagnosis: Thou shouldst say concerning him: "One having a break in his upper arm, on which a wound has been infected. An ailment with which I will contend." Second examination: If , however, thou findest that wound which is over the break, with blood issuing from it, and piercing through to the interior of his injury. Second diagnosis: Thou shouldst say concerning him; "One having a break in his upper arm, over which a wound has been inflicted, piercing through. An ailment not to be treated." Case Thirty-Eight: Instructions concerning a split in his upper arm. Examination: If thou examinest a man having a split in his upper arm, (and) thou shouldst find the swelling protruding, on the outside of that split, which is in his upper arm. Diagnosis: Thou shouldst say concerning him: "One having a split in his upper arm. An ailment which I will treat." Treatment: Thou shouldst bind it with ymrw; thou shouldst treat it afterwards with honey, every day until he recovers. Case Thirty-Nine: Instructions concerning tumors with prominent head in his breast. Examination: If thou examinest a man having a tumour with prominent head in his breast, (and) thou findest that the swellings have spread with pus over his breast, (and) have produced redness, while it is very hot therein, when thy hand touches him. Diagnosis: Thou shouldst say concerning him: "One having tumors with prominent head in his breast, (and) they produce cysts of pus. An ailment which I will treat with the fire-drill." Treatment: Thou shouldst burn him over his breast (and) over those tumors which are on his breast. Thou shouldst treat him with wound treatment , Thou shouldst not prevent its opening of itself, that there may be no mnh-w in his wound (sore?). Every wound (sore?) that arises in his breast dries up as soon as it opens of itself. "It is like parti-colored things whose product is pus. Case Forty: Instructions concerning a wound in his breast. Examination: If thou examinest a man having a wound in his breast, penetrating to the bone, perforation the manubrium of his sternum, thou shouldst press the manubrium of his sternum with thy fingers, (although) he shudders exceedingly. Diagnosis: Thou shouldst say concerning him: "One having a wound in his breast, penetrating to the bone, perforating the manubrium of his sternum. An ailment which I will treat." Treatment: Thou shouldst bind it with fresh meat the first day; thou shouldst treat it afterward with grease, honey, (and) lint every day, until he recovers. Gloss: "The manubrium of his sternum," (means) the upper head of his sternum; it is like it were a porcupine. Case Forty-One: Instructions concerning a diseased wound in his breast. Examination: If thou examinest a man having a diseased wound in his breast, while that wound is inflamed and a whirl of inflammation continually issues from the mouth of that wound at thy touch; the two lips of that wound are ruddy, while that man continues to be feverish from it; his flesh cannot receive a bandage, that wound cannot take a margin of skin; the granulation which is in the mouth of that wound is watery, their surface is not and secretions drop therefrom in an oily state. Diagnosis: Thou shouldst say concerning him: "One having a diseased wound in his breast, it being inflamed, (and) he continues to have fever from it. An ailment which I will treat." a. Leaves of willow, nbs�-tree ksnty. Apply to it. b. Leaves of ym�-tree, dung. hny-t�, ksnty, Apply to it. a. Powder of green pigment wsb-t, thn.t, grease. Triturate bind upon it. Thou shalt make for him poultices: Red spnn, garden tongue, d�r.t, sycamore leaves. Bind upon it. If the like befalls in any member thou shalt treat him according to these instructions. Gloss: "A diseased wound in his breast, inflamed," it means that the wound which is in his break is sluggish, without closing up; high fever comes forth from it, its two [lips] are red, (and) its mouth is open. The "Treatise on what pertains to a wound" says concerning it: "It means that there is very great swelling; (and) inflamed� is said concerning the height" (of the fever). "A whirl of inflammation in his wound," means a whirl of inflammation which circulates through the interior of his entire wound. "Its two lips are ruddy," means that its two lips are red like the color of the tms�-tree. "His flesh cannot receive a bandage," means that his flesh will not receive the remedies because of the inflammation which is in his flesh. "While heat continually issues (new) from the mouth of his wound at thy touch" (means) that heat comes froth from his wound at thy touch; as it is said that a thing which has come forth entirely, has issued (nsw). Case Forty-Two: Instructions concerning a sprain in the ribs of his breast. Diagnosis: Thou shouldst say concerning him: "One having a pain in the ribs of his breast. An ailment which I will treat." Treatment: Thou shouldst bind it with ymrw; thou shouldst treat it afterwards with honey every day until he recovers. Gloss: "Ribs of his breast," means the bones of his sternum being spine(s) like as it were a spine-roast. Case Forty-Three: Instructions concerning a dislocation of the ribs of his breast. Diagnosis: Thou shouldst say concerning him: "One having a dislocation in the ribs of his breast. An ailment which I will treat." Treatment: Thou shouldst bind it with ymrw; thou shouldst treat it afterwards with honey every day, until he recovers. Gloss: "A dislocation in the ribs of his breast," means a displacement of the heads of the ribs of his breast (sternum), which are fastened to his breast (sternum). "He suffers with swellings in his two sides," means that he suffers in the articulations thereof in his breast (sternum) spreading in his two sides. "His two sides," means his two flanks. Case Forty-Four: Instructions concerning a break in the ribs of his breast. Examination: If thou examinest a man having a break in the ribs of his breast, over which a wound has been inflicted; (and) thou findest that the ribs of breast crepitate under thy fingers. Diagnosis: Thou shouldst say concerning him: "One having a break in the ribs of his breast, over which a wound has been inflicted. An ailment not to be treated." Case Forty-Five: Instructions concerning bulging tumors on his breast. Examination: If thou examinest a man having tumors on his breast, (and) thou findest that swelling have spread over his breast; if thou puttest thy hand upon his breast upon these tumors, (and) thou findest them very cool, there being no fever at all therein when thy hand touches him; they have no granulation, they form no fluid, they do not generate secretions of fluid, and they are bulging to thy hand. Diagnosis: Thou shouldst say concerning him: "One having tumors. An ailment with which I will contend." Treatment: There is no treatment. If thou findest tumors in any member of a man, thou shalt treat him according to these directions. Gloss: "Bulging tumors on his breast." means the existence of swellings on his breast, large, spreading and hard; touching them is like touching a ball of wrappings; the comparison is to a green hemat fruit, which is hard and cool under thy hand, like touching those swellings which are on his breast. Case Forty-Six: Instructions concerning an abscess with prominent head in his breast. Examination: If thou examinest a man having an abscess with prominent head in his breast: (and) thou findest a very large swelling protruding on his breast, oily, like fluid under thy hand, while they produce some clamminess of the surface, (and) their faces have no ruddiness. Diagnosis: Thou shouldst say concerning him: "One having an abscess with prominent head in his breast .An ailment which I will treat with cold applications to that abscess which is in his breast." a. Sh,t-fruit, ntr.t, ksnty, Triturate, bind upon it. b. Fruit of ss, ksnty, mason�s mortar, water Triturate, bind upon it. Leaves of acacia, sycamore, juice of ym�-leaves, ox dung, hny-t�, Bind upon it. a. powder of green pigment, drt of cedar, ointement fat, northern salt, ibex grease, Bind upon it. Thou shouldst make for him poultices: Red spnn, sycamore. Triturate, apply to it. Gloss: "An abscess with prominent head in his breast," means that there is a large swelling due to the injury which is in his breast, soft like fluids under the hand . "Clamminess of their surface", means their skin is not hot. "There is no ruddiness upon it," means that there is no redness upon it. Case Forty-Seven: Instructions concerning a gaping wound in his shoulder. First examination: If thou examinest a man having a gaping wound in his shoulder its flesh being laid back and its sides separated, while he suffers with swelling (in) his shoulder blade, thou shouldst palpate his wound, shouldst thou find its gash separated from its sides in his wound, as a roll of linen is unrolled, (and) it is painful when he raises his arm on account of it, thou shouldst draw together for him his gash with stitching. First diagnosis: Thou shouldst say concerning him: "One having a gaping wound in his shoulder, its flesh being laid back and its sides separated while he suffers with swelling in his shoulder blade. An ailment which I will treat." Second examination and treatment: If thou findest that wound open and its stitching loose, thou shouldst draw together for him its gash with two strips of linen over that gash; thou shouldst treat it afterwards with grease, honey, (and) lint every day until he recovers. If thou findest a wound, its flesh laid back, it sides separated, in any member of a man, thou shouldst treat it according to these directions. Third examination: If however, thou findest that his flesh has developed inflammation form that wound which is in his shoulder, while that wound is inflamed, open, and its stitching loose, thou shouldst lay thy hand upon it. Shouldst thou find inflammation issuing from the mouth of his wound at thy touch, and secretions discharging therefrom are cool like wenesh-juice. Third diagnosis: Thou shouldst say concerning him: "One having a wound in his shoulder, it being inflamed, and he continues to have fever from it. An ailment with which I will contend." Fourth examination: If then thou findest that man continuing to have fever, while that wound is inflamed. Fourth treatment: Thou shalt not bind it; thou shalt moor (him) at his mooring stakes, until the period of his injury passes by. Fifth examination: If however, his fever abates and the inflammation in the mouth of his wound dissipates entirely. Fifth treatment: Thou shouldst treat him afterward with grease, honey, (and) lint every day, until he recovers. Case Forty-Eight: Instructions concerning a sprain of a vertebra [in] his spinal column. Examination: If thou examinest [a man having] a sprain in a vertebra of his spinal column, thou shouldst say to him: "Extend now thy two legs (and) contract them both (again)." When he extends them both he contracts them both immediately because of the pain he causes in the vertebra of his spinal column in which he suffers. Diagnosis: Thou shouldst say concerning him: "One having a sprain in a vertebra of his spinal column. An ailment which I will treat."